About two weeks ago, a massive storm hit the Berkshires in western Massachusetts. Six trees went down in our yard that night, including one spectacular white pine nearly a hundred feet tall that stood sentinel at the edge between yard and wetland. 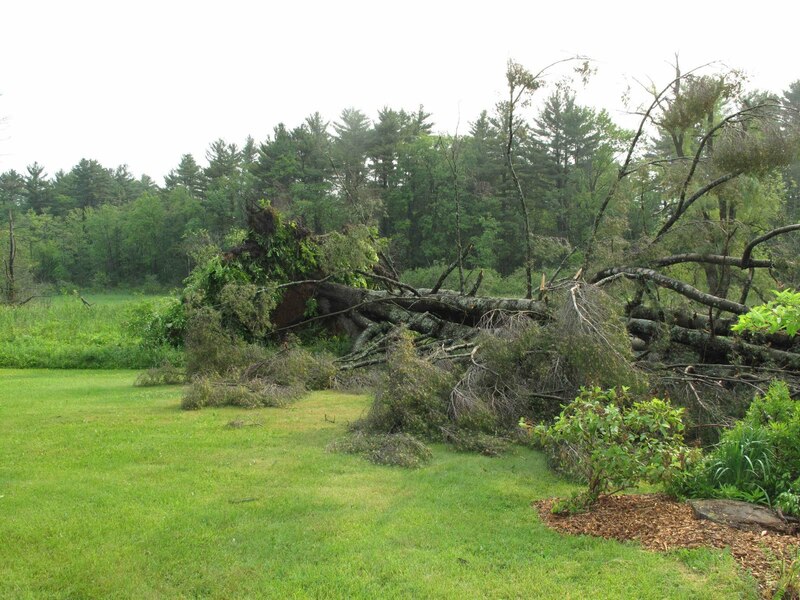 Some called the wind a micro-burst; some called it a tornado. I call it terrifying when the winds reach a speed that produces a high pitched, singing sound. I wanted to hide. The next morning I surveyed the damage and took pictures, which I then sent to various family and friends. My older daughter was first to reply: “That’s Rob’s tree isn’t it? He’ll be so sad.” Rob is a painter and has painted landscapes, which include that tree, so yes, he has a claim. In my reply, however, I mentioned that I thought it was my husband’s tree, as he was the one who climbed up with a ladder to remove dead branches and stubs, to give the tree its particularly graceful shape. My younger daughter then weighed in: “That was our tree. The tree we were looking at when we got married. And now it’s gone!” I reminded her that she has the painting made of that tree during the week of the wedding. I also mentioned that it is now a unique wedding, as nobody else can ever be married in front of that tree again. She’s a botanist, a plantswoman who understands the cycle of growth and decay. She laughed. A couple of days later I had the occasion to speak with the previous owner of our house and with her daughter. They were both sorry to see the big old tree down, and the daughter shook her head. “That was the tree-house tree.” So even before our family grew attached to the old white pine, another family had claimed and loved it. About a week after the storm, our son and his family came to visit. The youngest grandson was very excited to see such an enormous tree lying on the ground; its root-ball rose more than twenty feet into the air which is pretty tall for a six-year-old. It wasn’t exactly lying on the ground, however. It was lying on (squashing) one of my favorite gardens. My daughter-in-law took one look and said, “Oh no! It fell on our garden!” And indeed it had, for that garden was planted by the women and children in the family several years ago. So yes, we’re all sorry to see such a majestic tree come to the end of its life. And a part of me worries what we’ll find when the trunk is lifted off—how much of the garden will survive? But I can’t worry too much. No people, no buildings, no cars were harmed in the treefall. And plants have strong roots. They can sustain injury and re-grow. So whose tree was it really? It belonged to all of us. And now, as the slow process of decay begins, as it is hauled off to be ground into mulch, it will return to the earth from which it sprung. A good long life, for a beautiful tree.